Spontaneity coupled with obsession... Je regrette rien! I've been so busy lately that I haven't been keeping an ear to the ground with regards to the things that are happening on the Internets, so I just found out about Spoonflower. They're in invite-only beta mode at the moment, so I signed up to the waiting list. "Spoonflower gives individuals the power to print their own designs on fabric that they can then use to make quilts, clothes, pillows, blankets, framed textile art and many, many other things that might surprise you." It occurred to me last night that I'm extremely, extremely lucky. Not just for the usual reasons of having a job and my health and a great family and all that - I'm grateful for that of course. I was looking at my three wheels and all the spindles I've collected over the past few years, as well as my stunning fiber stash and all my amazing and beautiful fiberart friends and I realized that not everyone has this. I'm so happy I'm friends with all of you guys and I have all this fiberart in my life. Definitely scaled back (pine and plywood) and being sold as an entry-level budget model, but I wouldn't turn it down by any means. It's being sold at $469. I was horrified when I found out my tiny little Louet Victoria, which I bought for (in my opinion a slightly high) $620, was going for $733. These are astronomical price increases. Since most of the companies that make spinning wheels are not US-based, I'm assuming that this price jump is based on a combination of currency fluctuation and fuel costs, and not the fact that people with more disposable income are getting into spinning and the price increases are just a greedy grab for more profit margin, right? All this is more incentive for me to start a spinning wheel company...someday. It's an old handmade spinning wheel of a design I've never seen before. I bought it very inexpensively (by wheel standards) and it is still functional. The wheel and the flyer assembly are made of metal, probably aluminum. It's double drive, and the brake tension is adjusted by sliding the flyer assembly out along the wooden "rails" and anchoring with a wingnut. It's being shipped to me and I should have it in my home very soon. I can think of little else at the moment. I began a pair of socks with an all-over lace pattern out of three-ply yarn spun from Tactile Fiber Arts naturally dyed Wensleydale. I read Ravelry forums a lot. Usually, I can find some really interesting threads, but after the first few informative posts, I generally get too irritated to continue reading. Part of the underlying set of problems that contribute to this high incidence of miscommunication is the popular romantic misconception that merely being a knitting or fiberart hobbyist means that you share a sacred bond with everyone else who does the same thing. Knitting is a a vocation for a few, a passion for many, and to still others, just something they do with their hands. We're not priests, doctors, or legal officers; we don't take any oaths to uphold any sort of moral or ethical ideal and we owe each other nothing. We're a big group of people which likes to make things on sticks with yarn. Just like any other group of people I'm involved with, I love many of them, I like most of them, and there's a small subset who I wouldn't stop on the street to piss on if they were collectively on fire. So, when I read comments from people who say things like, "I don't want to have the ability to ignore other people who are demonstrated troublemakers; we're both knitters, we'll work it out", or "Everyone here should be posting pictures of their projects because that's a great resource to me and you owe it to the community", I sign off and go do something else. I don't need any sister knitters; I have three real sisters. We get along fine most of the time, but occasionally we can be judgemental, petty, mean-spirited, and sometimes senselessly cruel to one another. 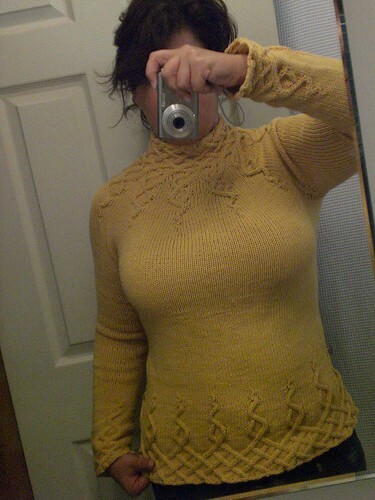 Actually, now that I think about it, maybe most knitters are my sisters. After tying up my bandhani project, I got impatient to see what it looked like and got out my natural dye supplies. I'd totally forgotten how amazingly gratifying it is to do. Although I only have one kettle and no thermometer, scale, or measuring equipment, I decided to throw caution to the wind and eyeball it to the best of my ability. The result was not a disaster. I know I got the ratios pretty accurately, but I didn't have any way to weigh the cloth and I overestimated - the result was a dark purple cloth (even though I used logwood grey) and a lot of extra pigment left over. The hand of the cloth isn't great, but it's not terrible and I'll definitely be able to make it work. Now that I know that I can do this with a minimum amount of hassle, I will be dyeing more in the future. I'm in the process of collecting yarns and finished pieces that bore me with the intention of overdyeing them to see what the result will be.